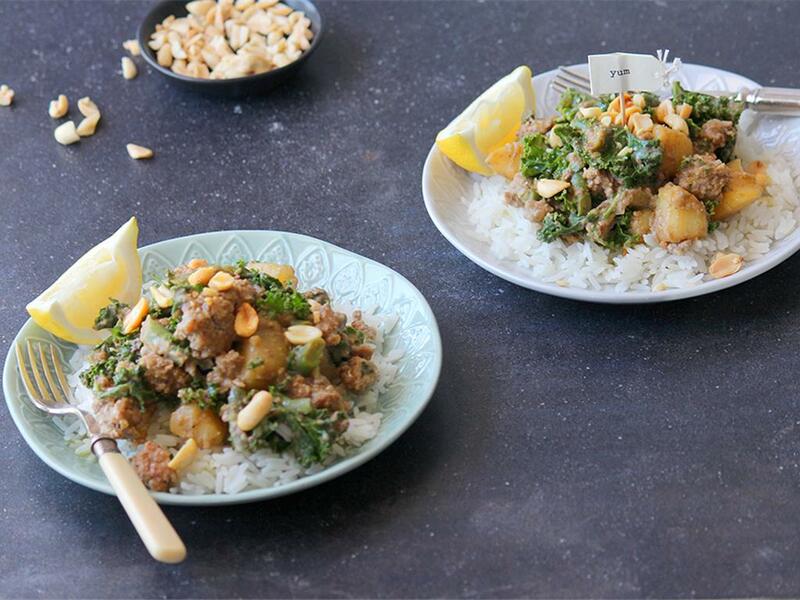 Peanut butter cardamom curry with pork, potatoes, kale and green beans served on rice. Kale: Discard the stalks of the kale and tear the leaves. Massage the leaves with your fingers for 30 seconds. Set aside. Pork mince: Place a pot on medium-high heat with a drizzle of olive oil. When hot, add the pork mince and season with a little salt and pepper. Brown for 3 minutes until golden, then remove and set aside. Peanut potato curry: Using the same pot, add the onion with a pinch of salt and sauté for 3 minutes before adding the ground ginger and Cardamom Curry Mix. Sauté for another two minutes then add the garlic, potatoes and water (1½ cups for 4; ¾ for 2). Cover and let it simmer (gently boil) for 15 minutes until the potatoes are nearly soft. Stir the curry every now and then to make sure it doesn’t burn. Add the peanut butter and a little more water (if all the water has evaporated) and stir. Then add the green beans and cook for 3-4 minutes until almost cooked. Add the kale and pork mince and cook for 2 minutes until the kale has wilted. Add the garam masala at the end and stir through. Serve the rice topped with the peanut potato curry, add a squeeze of lemon juice and sprinkle over the chopped peanuts.